Bara-Parsa tornado destroyed property worth loss over Rs. 90 million: Nepal Govt. Report - Integration Through Media ....! KATHMANDU: Property worth over Rs. 90 million was found destroyed by the tornado that lashed Bara and Parsa districts of the central Terai, Nepal on March 31. The loss was projected after the latest preliminary situation report (PSR) of less affected Parsa district was made public by the National Emergency Operation Centre (NEOC), under the Ministry of Home Affairs. An assessment coordination team (ACT) mobilised in Parsa district had prepared the report of the loss, including the physical destruction and casualties of livestock and the damages caused to agricultural sectors. 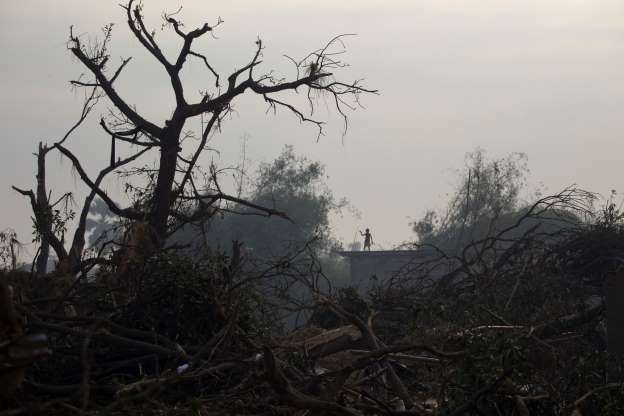 The ACT report stated that property worth about Rs.30 million was destroyed by the tornado in Parsa. “It will take two or three days to have the preliminary report of the total loss of property in the worst-hit Bara district,” Bedh Nidhi Khanal, under-secretary and chief at the National Emergency Operation Centre (NEOC), told The Rising Nepal. Similarly, a total of 2,637 homes were found hit by the tornado, according to NEOC. Of them, 1,273 homes were completely destroyed while 1,348 were damaged partially, according to Khanal. Of the totally destroyed homes, 1,183 were in Bara and 90 in Parsa. According to Khanal, the ACT prepared the statistics in the support of Red Cross Society and District Emergency Operation Centre (DEOC) and Nepal Police. Report collection on the disaster in Bara district has reached the final stage, according to Khanal. As per the details of the loss assessed in Parsa district by the ACT, houses equivalent to Rs. 10.49 million were damaged there. Similarly, private property worth Rs. 10.94 was damaged, according to Khanal. Likewise, the agricultural and livestock sectors suffered damages worth Rs. 4.247 million in the district. Likewise, property equivalent to Rs. 296,000 was lost when the tornado hit the drinking water and sanitation systems. However, the loss incurred by the industries was not included in the report. According to Khanal, it will take another one or two days to find the actual loss in physical infrastructure in Bara district. Similarly, four schools, five industries and three temples/mosques were damaged. According to the ACT, still 109 people injured in the tornado are receiving medical treatment in various hospitals in Kathmandu and other districts. Of the injured people, 63 are undergoing treatment at National Medical College, Parsa and 10 in TU Teaching Hospital, Kathmandu and B&B Hospital in Gwarko, Lalitpur. Wheat, maize, vegetables, fruits and cereals grown in 1,505 hectares of land were damaged completely while foods and vegetables of 2,231 hectares of land were partially damaged. The tornado killed 38 goats and injured 73. Likewise, 13 cows and buffaloes were killed and 23 others were injured. Similarly, 5,000 hens were killed and four sheds were damaged.